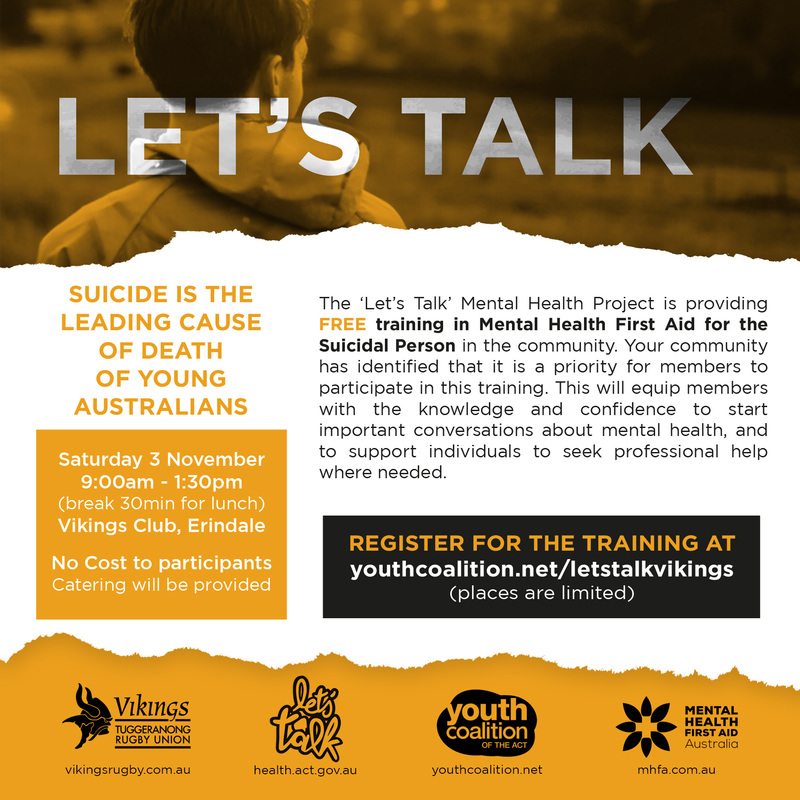 Vikings Rugby, in collaboration with the Youth Coalition of the ACT, will be hosting a Free Mental Health First Aid training course on the 3rd of November. The Youth Coalition have started an initiative called the ‘Let’s Talk’ Mental Health Project. As part of this initiative, they will be providing the Mental Health First Aid Course for Free for the Club to equip our members with the knowledge and confidence to start important conversations about mental health and to support individuals to seek professional help where needed. The course is 4 hours face to face and will teach you how to identify warning signs for mental health issues and suicide, how to confidently support a person in crisis and how to have a conversation with someone experiencing suicidal thoughts and behaviors. You will also receive an official certificate upon your completion. We’re hoping that those players, support staff and other members of the Club that complete the course will act as leaders for the rest of the Club and support other players and support staff through times of adversity. If you’re interested in doing the course (and yes it’s free – no strings attached!) Click here or take a look at the document attached below for more information. There are limited spaces available for this course so please register as soon as possible to secure a spot.